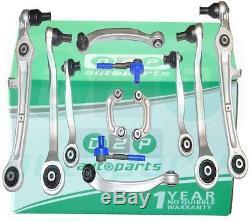 Suspension arm control set kit of triangles for audi a6 (c6) 04-11 before 4f0498998. Fitting Position: Front Axle left and right 8 x control arms 2 x tie rod ends 2 x drop links. 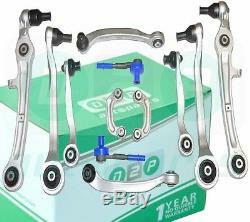 Oem part numbers: 4f0498998, 4f0 498 998. Chart Compatibility is for reference only. It is advisable to check the existing part number before placing an order. Audi - a6 - 2.0 tfsi. 06.05 - 03.11. Audi - a6 - 2.4. 05.04 - 10.08. Audi - a6 - 2.4 quattro. 01.05 - 10.08. Audi - a6 - 2.8 fsi. 10.08 - 03.11. Audi - a6 - 2.8 fsi quattro. 11.06 - 10.08. 06.07 - 10.08. Audi - a6 - 3.0 quattro. 05.04 - 05.06. Audi - a6 - 3.0 tfsi quattro. Audi - a6 - 3.2 fsi. 05.04 - 05.09. Audi - a6 - 3.2 fsi quattro. Audi - a6 - 4.2 quattro. Audi - a6 - 4.2 fsi quattro. 06.06 - 03.11. Audi - a6 - rs6 quattro. 09.08 - 08.10. Audi - a6 - s6. 0 3.0 6 - 03.11. Audi - a6 - 2.0 tdi. 07.04 - 03.11. 07.04 - 10.08. 11.08 - 03.11. Audi - a6 - 2.7 tdi. 11.04 - 03.11. Audi - a6 - 2.7 tdi quattro. 11.04 - 10.08. Audi - a6 - 3.0 tdi quattro. 05.04 - 03.11. Audi - a6 - 3.0 tdi. 06.06 - 10.08. 06.05 - 08.11. 0 3.0 5 - 10.08. 10.08 - 08.11. 0 3.0 5 - 05.06. 06.06 - 08.11. 04.08 - 08.10. 0 3.0 6 - 08.11. 09.05 - 06.06. 06.05 - 10.08. 0 3.0 5 - 08.11. 05.06 - 10.08. 05.06 - 12.10. 05.06 - 08.11. Please check the picture or part number before ordering. We have more than 30 years experience in the aftermarket industry, so do not forget to buy from us with 100% confidence! Al our products are new and high quality, directly from leading manufacturers for automotive laftermarket. All items will be shipped within 24 hours of purchase excluding weekends and holidays and will take 1-5 business days to arrive. Send us an email for international postal rates. Collection of southall, middlesex is also possible. Please contact us directly for bulk orders. Our goal is to answer all messages within 3 hours of receiving them. Registered customers of European Union VAT (excluding uk) can save the amount of the English VAT (20%) on their purchase! Please contact us to arrange the discount. It is the responsibility of the buyer to ensure that the parts purchased are correct for the car. All the information we have about fitting is given above. We advise you to cross the original equipment manufacturer (oem) to ensure that the correct mounting part is ordered. We will charge a 20% restocking fee if you purchase the incorrect item or are no longer in need of the item. All part numbers are for reference purposes only. We are not responsible for the cost of the work that may be incurred if we have problems with the game once mounted. Can be arranged and the appropriate details will be given when buying the item. International orders can take between 5-10 working days to arrive after shipment. The item "suspension arm set triangle kit for audi a6 (c6) 04-11 before 4f0498998" is on sale since Wednesday, February 6, 2019. 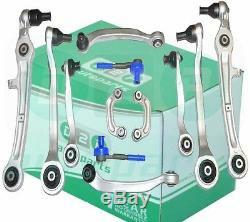 It is in the category "auto, motorcycle parts, accessories \ auto \ parts \ suspension, steering \ suspension arm ". The seller is "d2pautoparts10" and is located in London.